This hair oil for color treated hair, with custom-blended Morgina & Sweet Orange oil, illuminates and helps protect color treated hair. Rated 5 out of 5 by deena22 from Please bring this back!!! I still have just a tiny bit left, but I reach for this over the multiple oils I've paid $40+ for! 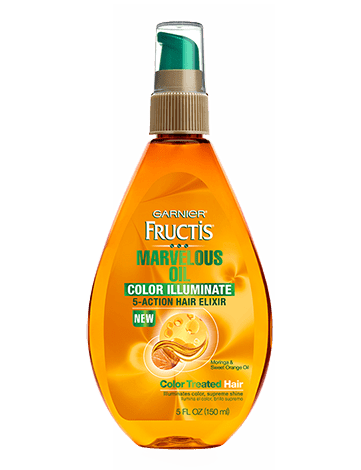 It works so well for my overworked hair and always keeps it shiny. Pleaseeee!! Rated 5 out of 5 by Tina 415 from LOVE! PLS BRING BACK!! I absolutely loved this product and now they have discontinued it. Please bring this product back! Rated 5 out of 5 by Hungergirl from Leaves hair so nice! Amazing product. It is the best shine and smoothing oil I've ever used. Leaves hair clean and not greasy. Lots of shine for dry, dull and frizzy hair! Rated 5 out of 5 by Birdie 1953 from A-Plus! I have gone thru a whole bottle of this latley. I got hooked when it made my fine , thin, and very light blonde hair more lustrous and nourished PLUS, SHINE SHINE. Rated 5 out of 5 by vas1097 from Love This I had ran out of my normal product (salon purchased) and purchased this instead. I love this stuff. I have fine, colored hair that sometimes can get dry when I blow dry it. I use this product while my hair is damp and just before blow drying. My hair feels soft, it doesn't take as long to blow dry, and my color looks great after using. I have not tried it yet as an over night treatment. I have found a new and less expensive hair oil.